Recently I purchased a book written by Dallas Police Chief Jesse Curry titled “JFK Assassination File”. 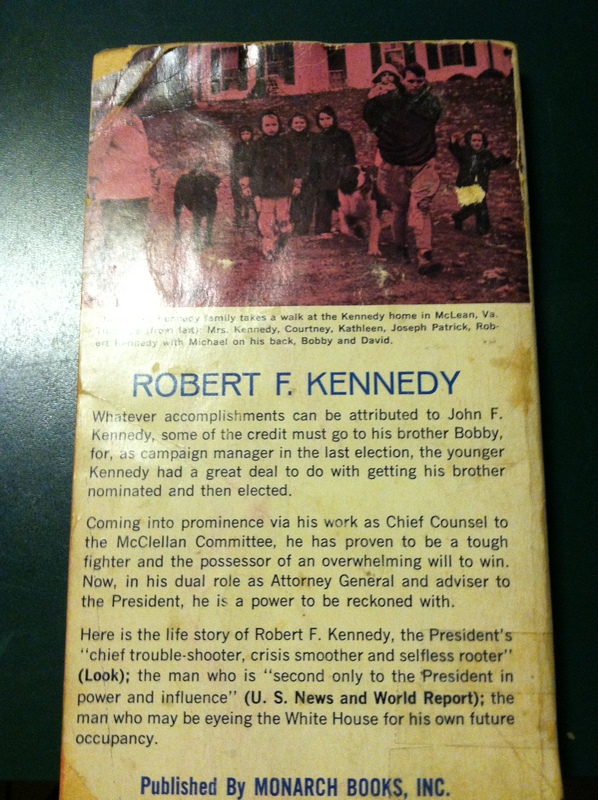 This book was written in 1969, some 6 years after the assassination of President Kennedy and with conspiracy theories mounting around this time, this book would be an ideal way to get some monetary gain from the events in Dallas. Throughout this post I will highlight some of the parts of the book that stand out, and others that seem to be at odds of what he had said 6 years prior. 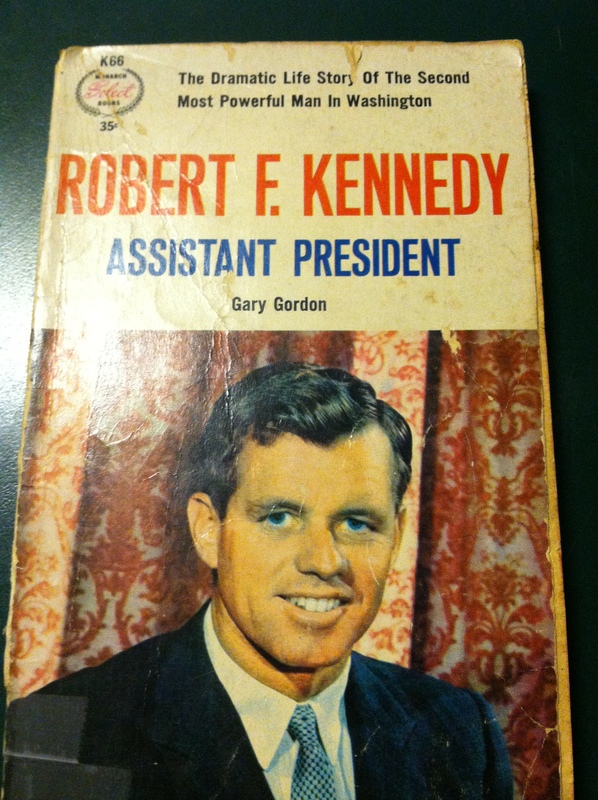 This book was not on the bestseller list by no means, but it does give a viewpoint from the man that not only help set up the security surrounding the President of the United States visit, but also the security of the alleged assassin Lee Harvey Oswald. Throughout the beginning of the book Chief Curry explains the tension that was around Dallas at the time and the divide the city was having when it came to politics. 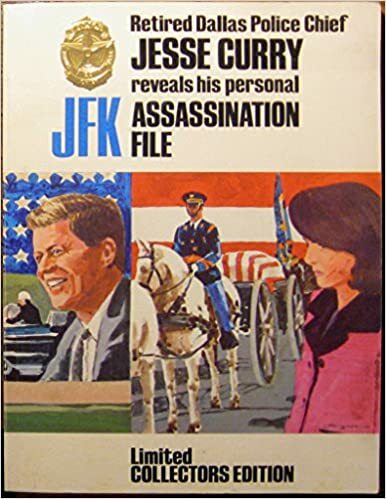 The shooting of General Edwin Walker on April, 10th 1963 was brought up in the beginning pages of the book, and the Chief points the finger to Oswald as the shooter, although this realization comes a month after the assassination of President Kennedy. The shooting of General Walker and the treatment of Ambassador Adlai Stevenson just a month before the Presidential visit prompted Chief Curry to use an unprecedented amount of the police force for the visit of President Kennedy. In chapter two of his book, Chief Curry squarely puts the blame of the protection of the President on the Secret Service. As he mentions, “The Secret Service was entirely in charge of arranging the route and the press announcement was to be made by the host committee comprised of leading Dallas citizens”. Not known to Chief Curry at this time, one of the leading men on that committee would be the head of the Acme Building Maintenance Company Frank C. Jones, and it was his company that had access to the TSBD the night before the assassination. To Chief Curry, the Secret Service did not do enough prep work for the motorcade route and that areas of the route were not looked at closely. Instead, the area in which the President would be giving his speech, would be heavily guarded by Dallas Policemen. The Police Chief states, “The Secret Service were much more concerned about the security problems of the Trade Mart than any other single element of the President’s stay in Dallas”. Again, the Police Chief refuses to put any of the blame of the assassination onto his police force, and puts the entire blame onto the Secret Service. Many times in the book, Police Chief Curry highlights the things that the Secret Service did wrong, and we know that they did. But at the same time, he highlights things that his department did right. It is hard to think that anything went right during this trip with a President headed back in a casket. It should be noted that Police Chief Curry was aboard Air Force One while Lyndon Johnson was taking the oath of office. Instead of getting to the scene of the crime, he was instead trying to be a part of history that he didn’t need to be at. It’s fair to say, then, that the interrogation of Oswald with respect to either the death of Tippit or of President Kennedy was in accordance with the normal procedures of the department ? It would appear that Chief Curry thought the interrogation of Oswald was within standard procedure, but 6 years later he changed his mind. The protection of Lee Oswald was something that did fall squarely into the hands of the Dallas Police Department and Police Chief Curry. The transfer of Oswald from Police Headquarters to the County Jail is something that will be looked at for a long time. How could the prime suspect in the murder of the President of the United States be killed while being transferred? The protection of Oswald has been questioned for years and Curry points out many times that he wanted to give Oswald space and rest so that he would be more willing to talk. During the planning process for the transfer it was determined that an armored truck would be taking Oswald to the county jail and that the media would be able to film the transfer. In actuality the armored truck was going to be used as a decoy and Oswald would be in a squad car. It would appear in the reading that the scope of the moment in history may have gotten to Curry because he felt the need to showcase this suspect. 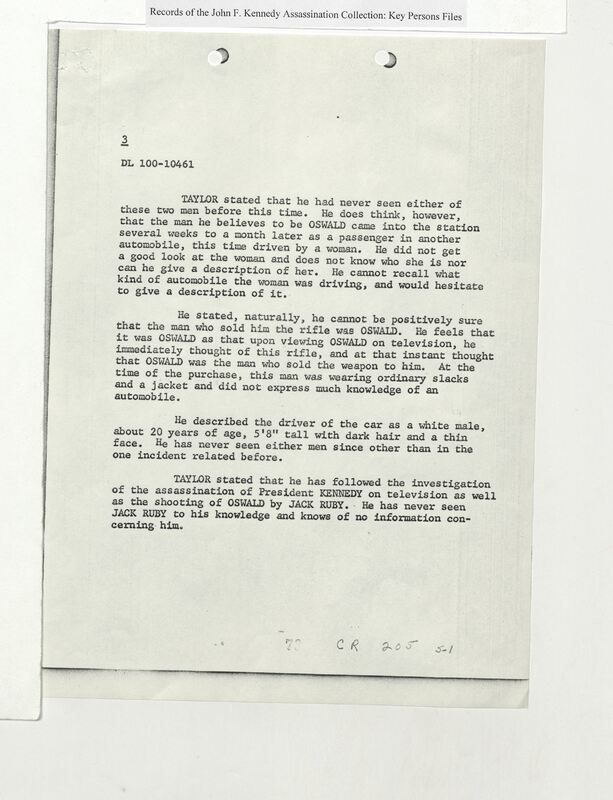 Not having been in a situation like this, and feeling the pressure of the national media, Curry decided to let the media into the basement for the transfer of Oswald. In true form as to the rest of this book, Curry states that his department is fully prepared for this event and says, “The security plans for the basement were entirely adequate”. History would prove otherwise to this statement, and Curry refuses to believe that his men let Ruby into the basement. If the security was well placed, then no one other than those from the national media would have been in that basement. In the book, Curry states that the media was designated an area within the basement away from where Oswald was to be. An area that the media could set up and film the transfer without them seeing the police use the decoy vehicle. As Oswald came out from the elevator and headed into the basement, the media seemed to be right on top of him. This so-called designated area was so close to Oswald that each of them could reach out and touch him. It is Curry that states that he believed that the media made a mad rush to Oswald as he came out of the elevator and this enabled Ruby to get as close as he did within the commotion, he states, “In the enthusiasm of the moment, newsmen spilled across the drive toward the police elevator”. In all of the television broadcasts, it is apparent that all of them were able to set up their cameras in the locations that they were filming from and that they did not move. In the coverage from NBC, the camera is stationary and did not move. This book is a good informative inside look at the details that surrounded the security plans for the President’s visit to Dallas and the aftermath. The details in this book come from a Police Chief that believed his police force did everything they could to protect the President of the United States, and when it did not, he put the blame on others involved. Although the Secret Service was in charge of protecting the President, it was Curry’s police department that was in charge of protecting the truth and it failed when Oswald was killed inside of police headquarters. I recommend this book to those that have followed the assassination so that they can get a look from the view of Jesse Curry. For many JFK assassination researchers, the daunting task of going through the many files that are available to them can be very challenging at times. However, their comes a time when you find that one thing in the files that makes you just go “all in” on it. I came across that file about two months ago, and over the course of the next few posts I will go more in depth with it. The file that I found was only in a couple of reports that I have seen in the many hours of looking through them. It involved a company named the Acme Building & Maintenance Company. Not familiar with it? Neither was I, and in the report I found some key things that should have been investigated further by the Warren Commission. 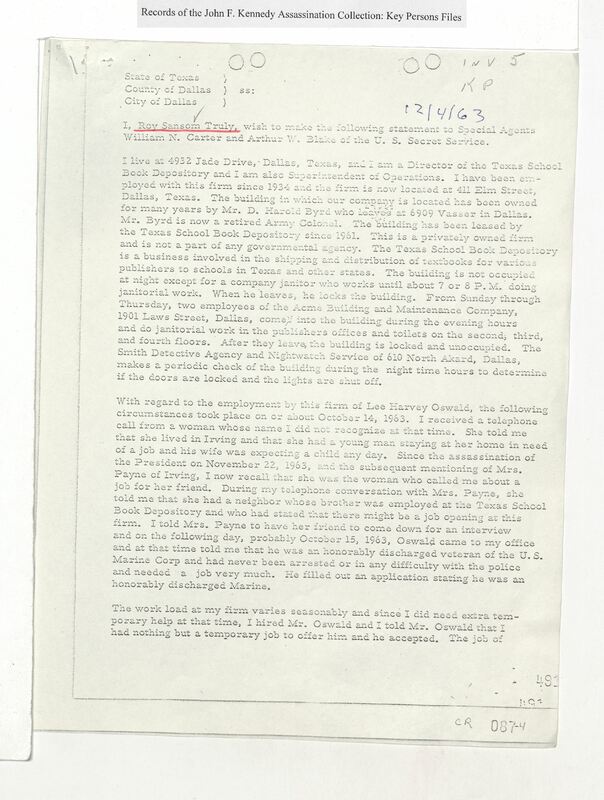 The report which was in the file of Roy Truly ( TSBD Supervisor), showed in one of the paragraphs about a cleaning company that would come in each and every night and work inside of The Texas School Book Depository. The cleaning company which is named in the file as Acme Building & Maintenance would have 2 employees come into the building after hours and work inside of the building alone until about 12:00 in the morning. The most alarming part about the paragraph was that the Acme Building & Maintenance Company had two employees who had a key to the Texas School Book Depository. So here we have a company that has access to the TSBD after every employee of the warehouse is gone for the day. In looking through various files I can not find anywhere that the Warren Commission looked into this matter. We know that the Warren Commission refused to look at anything other than what would benefit their own version of what happened that day. The company which was located at 1901 Laws Street in Dallas, was one of the leading cleaning companies in the city. 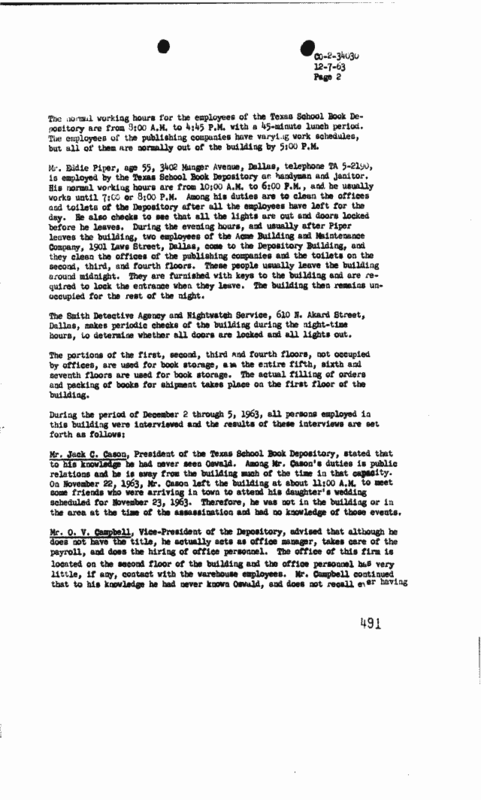 The Texas School Book Depository was a fairly new account and to be able to have access to the building at this time would benefit any potential assassin. The names of the employees who has keys are not listed in the report, and this should have been of some concern to law enforcement looking into the assassination. At no time did any of the officials look into this matter. At any time during the night someone could have planted the gun that was found on the sixth floor. This would have given the conspirators plenty of time to set up the boxes without the worry about anyone seeing them up there. At no time does anyone see Oswald stacking boxes on the sixth floor near the southeast corner. Some of the fingerprints found on the cartons of boxes did not match those that were employees of the Texas School Book Depository. The employees who would have had access to those particular cartons were not found anywhere on them. The fingerprints that were found were not matched up to anyone who may have worked for the Acme Building & Maintenance Company during this time. What I found in this file about the Acme Building & Maintenance Company may not be new to some, but for me it was something that I was not aware of. It sparked a new interest as to who else might have had keys and who were the ones handing out the keys to the building. A simple paragraph that seems to have been forgotten about in the many pages of the JFK assassination files. In the coming weeks I will be posting about the owner of the Acme Building & Maintenance Company and how the company completely went away and the location of the company is now a parking lot. In a post that I put together a few weeks ago, I talked briefly about a rifle range that Lee Harvey Oswald was seen at. During the course of November, Lee Harvey Oswald is seen by witnesses at the SportsDome Rifle Range in Irving. As many as 9 witnesses are able to place Oswald at this location on several different dates in the month of November. To some people this may not seem too important because they believe that Oswald did not shoot the rifle on November 22nd, 1963. 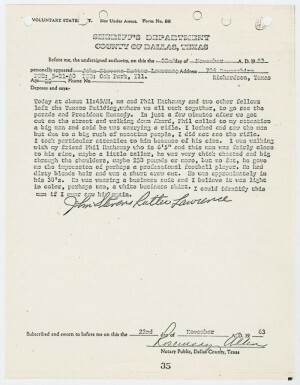 There is evidence that points to the paraffin tests that conclude that Oswald only had residue from a pistol on his hands that day and that he did not fire that rifle. I am with the opinion that he may not have shot the rifle on that day but he did shoot it on other days in that month. The witnesses not only saw Oswald, but they saw him with other people as well. These other individuals that were seen with Oswald could have been key witnesses had the Warren Commission not left them out. The story of the SportsDome Rifle Range, which is owned and operated by Floyd Davis and his wife , could be a link to other individuals involved in the assassination. The Warren Commission in their report put the rifle range story into their “rumors and speculation” part of the report. They only mention Oswald practicing with the rifle with his brother during a hunting trip. So why would they want to leave the rifle range out? It would seem to fit their intention of putting Oswald behind the trigger on November 22nd, but yet they choose to leave out these witnesses. It is simple, the witnesses at the rifle range saw Lee Harvey Oswald, but he was not alone. The rifle range was opened to the public towards the end of October 1963, and during the time before the assassination, Oswald is seen at least 3 different times at this rifle range. On November 16th, 1963, Dr. Homer Wood and his 12-year-old son Sterling were at the SportsDome Rifle range when they noticed an individual firing a rifle in the booth next to them. It seemed to them that he was acting strange. The individual in the booth next to them was firing his weapon and catching the shell casings as they were being ejected from the weapon. This caught the attention of the son, who then started to watch this individual more. According to the son, the individual who looked identical to Oswald according to their statements, was firing his weapon and the weapon would have a spark come from the rifle after each shot. An important clue, because no one in Dealey Plaza who looked up at the sixth floor window of the Texas School Book Depository noticed any sparks coming from the window. So, if this was Oswald using his gun at the rifle range, then the gun seen by others during the assassination would have noticed these sparks. No sparks were reported by any of the witnesses in Dealey Plaza. 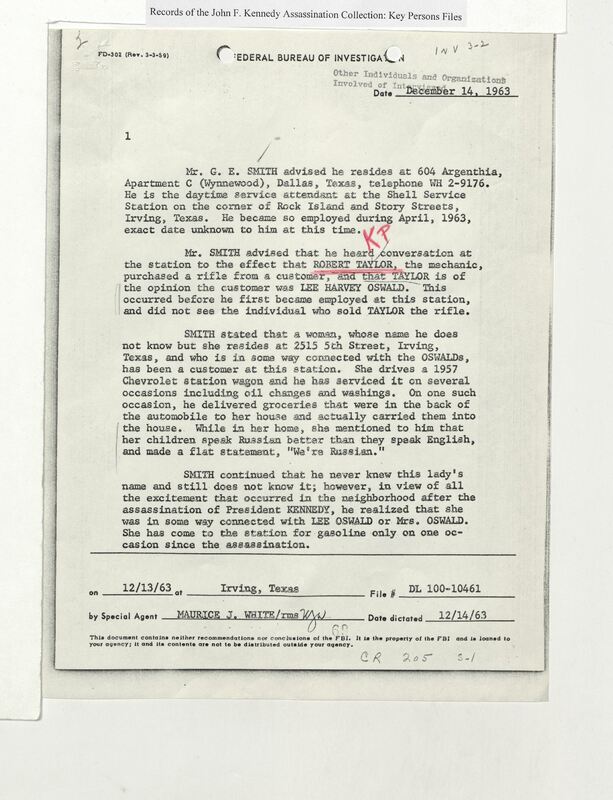 These two witnesses noticed someone was with Oswald at the time he was at the rifle range, and they describe this person to be about 6 ft. tall, weighing anywhere from about 220-240 pounds. There is no indication that the Dallas Police ever tried looking for this man. This same description of the individual with Oswald was given by others who also saw both of these men at the rifle range together. Another witness to Lee Harvey Oswald being at the SportsDome Rifle range was Garland Slack. This individual is interesting because of not only him seeing Oswald at the rifle range, he was also present in Dealey Plaza when the motorcade came by. According to the statement given by Mr. Slack, he had an incident with the man he later identified as Lee Harvey Oswald. According to Mr. Slack, he got into a slight argument with Oswald because of him shooting at Mr. Slack’s target. There were some words exchanged by the two men, and eventually Oswald left the rifle range without further incident. According to his statement, Mr. 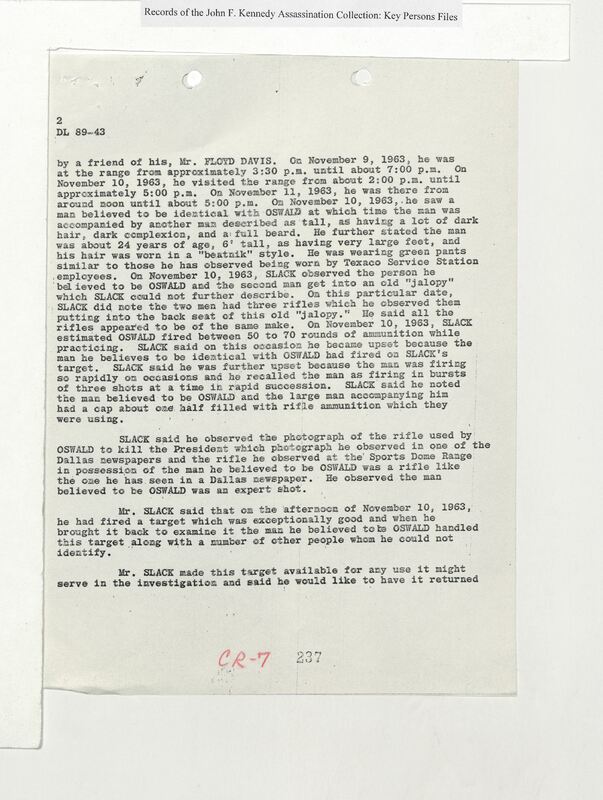 Slack kept the target paper that Oswald was shooting at the day of the incident, and that he handed it over to police. On November 22nd, 1963, Garland Slack is standing near the intersection of Houston and Elm Street when the Presidential motorcade goes by. He is unable to see the President, as the crowds had pushed him too far back. As the motorcade made the turn onto Elm, he heard the first shot which he thought came from the Triple Underpass. When the third shot went off, he was more convinced that some of the shots came from the depository. It is interesting to note, how a man who claims he saw Oswald at the rifle range just a few days before, is able to be in the prime location of the assassination. The statements that Mr. Slack gives, states that he was at the rifle range November 9th, 10th, and 17th. Again, he mentions that Oswald is not alone at the rifle range when he sees him. In some of his statements, Mr. 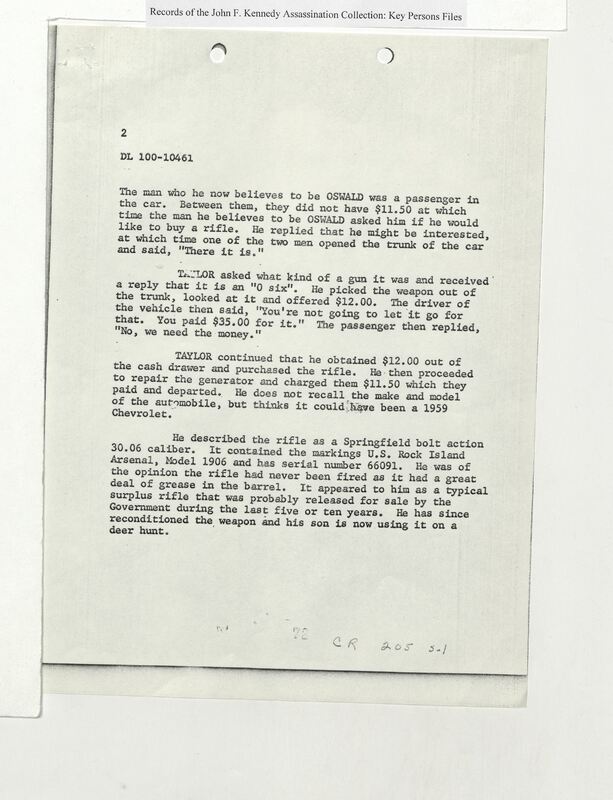 Slack mentions that Oswald was being driven to the rifle range by a man named “Frazier”. The Warren Commission decides that this does not fit their story too well, and they decide to leave out these witnesses in the final report. 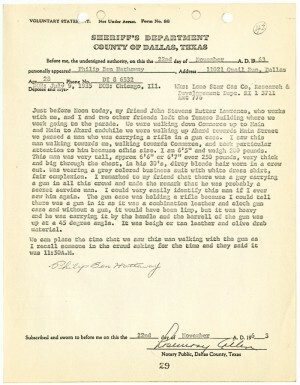 The decision to not further investigate the individual who was seen with Oswald at the rifle range, further fuels speculation that others were involved. The Warren Commission could have used these witnesses to back up their story of Oswald using the rifle before the assassination, but instead they decided to leave it out, because of the mention of others with Oswald at the time. Another witness at the rifle range is Malcolm Price. 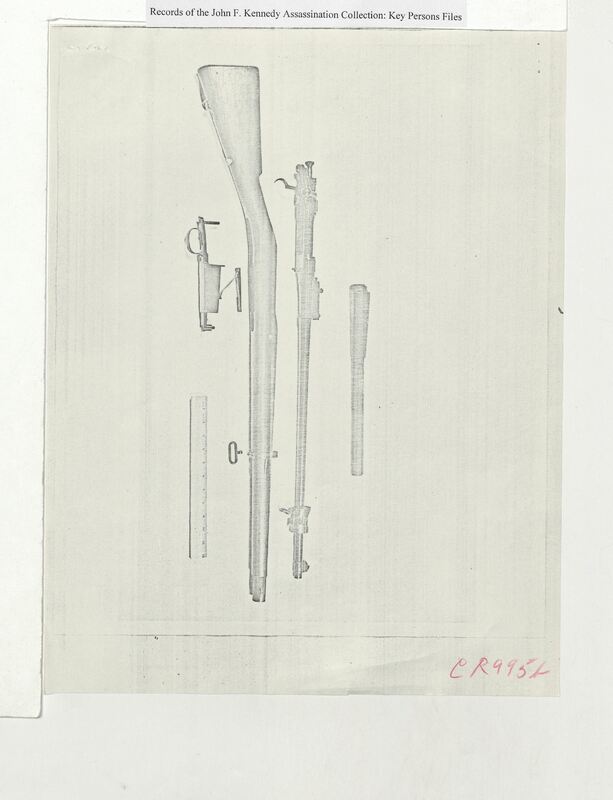 In his statements he claims that he helped sight the scope on Oswald’s rifle, and that Oswald tried out the new scope right in front of him. Their are lots of these types of stories and not all of them may be true, but when you have witnesses that are all seeing the same thing, then maybe these types of things should have been looked into further. The rifle range story is just one of many stories that were never fully told by the Warren Commission. 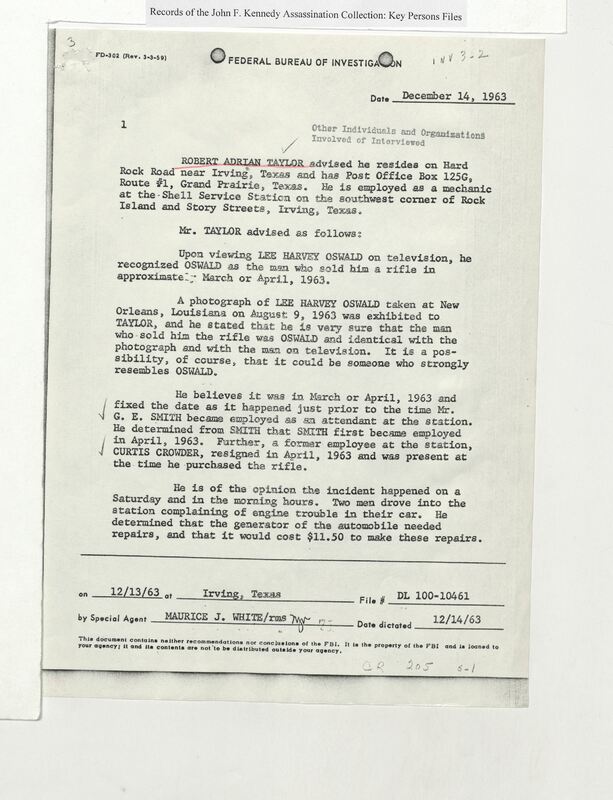 The description of the man seen with Oswald on these dates, fits the description of a man walking in Dallas with a rifle case, on the morning of November 22nd, 1963. Dallas (Tex.). 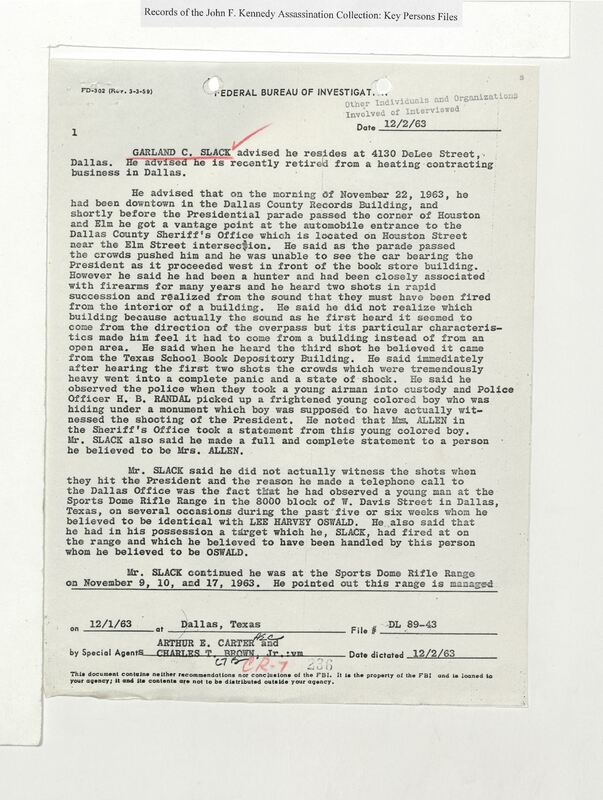 Police Dept.. [Information Regarding Oswald’s Firing His Rifle on the Sporting Gun Range #1], Text, December 2, 1963; digital images, (http://texashistory.unt.edu/ark:/67531/metapth337276/ : accessed January 13, 2014), University of North Texas Libraries, The Portal to Texas History, http://texashistory.unt.edu; crediting Dallas Municipal Archives , Dallas, Texas.